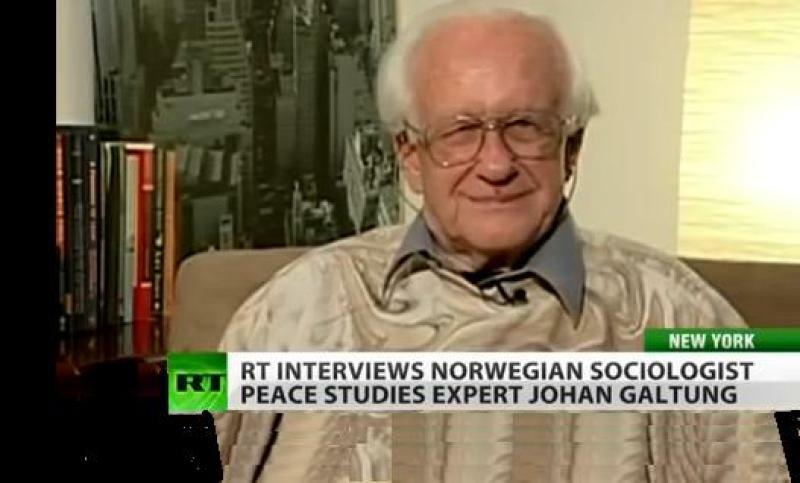 Galtung, Johan (2009). The Fall of the US Empire - and Then What? Successors, Regionalization or Globalization? US Fascism or US Blossoming?. Stadtschlaining, Austria, TRANSCEND University Press. This book explores a global phenomenon now taking place for the eyes of the world: The Fall of the US Empire. Nothing extraordinary about that, all empires so far have had life cycles, and the US Empire is no exception. In no way should that be confused with any fall of the USA; just to the contrary, the fall of the US Empire may lead to the blossoming of the US Republic. And in no way should the book be seen as "anti-American"; just to the contrary. Part I, The Present, explores the why, what, how, when and where of the present decline and fall of the US Empire, based on a theory used in 1980 to predict the fall of the Soviet empire. Part II, The Future, And Then What? explores the world as a whole with three global scenarios, successors, regionalization or globalization, mainly the latter, and the US Republic with two domestic scenarios, US fascism and US blossoming, mainly the latter. Part III, The Past, is dedicated to a study from 1979 comparing the Western Roman Empire processes with Western imperialism millennia later. (Editor's note: here are some other excerpts from the video. Galtung provides a date for the fall of the American empire: 2020. One might not take this seriously, except for the fact that the prediction he made in 1980 for the fall of the Soviet empire was 10 years and he was exactly correct with that prediction. He says that the same contradictions that made possible his Soviet prediction are now present in the United States. Among the dozens of contradictions, he mentions those between finance economy and real economy and between the economy and nature (i.e. environmental pollution and destruction), the competition with Europe and China, the military contradiction between terrorism and state terrorism, and the increasingly burdensome support of Israel. As Israel founders and US support for it diminishes, Galtung sees a great danger that the Americans will scapegoat Israel with a rise of anti-semitism. During the years leading up to the collapse of its empire, he predicts that the United States will realize that it is not gaining from foreign wars, will reduce its war-making and, eventually, withdraw from its global network of military bases. Also, he predicts that the country will realize that its exploitative relations abroad are not benficial in the long term and will increasingly replace them with equitable trade instead. Although the American empire is destined to collapse, the country can survive as a republic, especially if it follows his advice to work at the local municipal level instead of relying on Washington. He recommends Americans to organize local cooperatives and local food production instead of importation and agro-business, local banks instead of investment banks, local construction of affordable housing to provide jobs as well as housing. In this way Americans can protect themselves against the loss of their empire. This report was posted on April 1, 2014.